The volume 'Power?... To which people?!' is edited by the artist Jonas Staal and published by Jap Sam Books, April 2010. The volume Power?… To which people?! is edited by the artist Jonas Staal and published by Jap Sam Books, April 2010. Click here for the English version of BAVO’s essay. Klik hier voor de Nederlandse versie van BAVO’s essay. This publication Power… To Which People?! is a collection of contemporary texts, pamphlets and manifestoes concerning a selection from the work of visual artist Jonas Staal. (1981). In the publication, Staal’s oeuvre, in which the relation between art, politics, and ideology occupies a central position, functions as a platform for a dialogue with a selection of international authors whose work occupies itself with the political and social meaning of writing and publication, and where text is employed as a political instrument. Staal’s work has gained popularity through its emphatic socio-political thematics. His most well-known projects comprise the installation series The Geert Wilders works (2005), in which he installed a series of ‘roadside monuments’ in public space featuring the face of right-wing populist politician Geert Wilders. Two court cases ensued from this work, in which he was accused for threatening the politician. These court cases were re-established as his own productions, entitled respectively The Geert Wilders Works – A Trial I (2007) and The Geert Wilders Works – A Trial II (2008). Other works include Anatomy of a Car Bomb Wreckage (2007, together with artist Jack Segbars), in which he exhibited two car bomb wreckages from Iraq in Rotterdam, as a part of the sculpture collection of the city, and Bomb Wreck Jewellery (2009, together with Hartog & Henneman), in which a jewellery set was manufactured from debris of the bomb wreckages. The title Power… To Which People?! 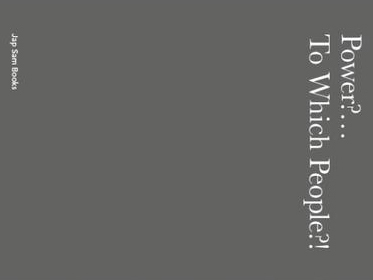 questions the famous slogan ‘Power to the people!’ Both in Staal’s oeuvre and in the authors’ contributions, the question about the locus of power in our society is put to discussion. Exactly through constantly placing this question on the forefront, they claim that a different politics, a different form of representation is possible. According to Staal, artists are also representatives of the people. The authors comprise Tunesia born writer Chris Keulemans, Romanian curator Mihnea Mircan, Serbian curator Marko Stamenkovic, the Belgian theoretical research group BAVO, and Dutch-Chinese writer Vincent van Gerven Oei.